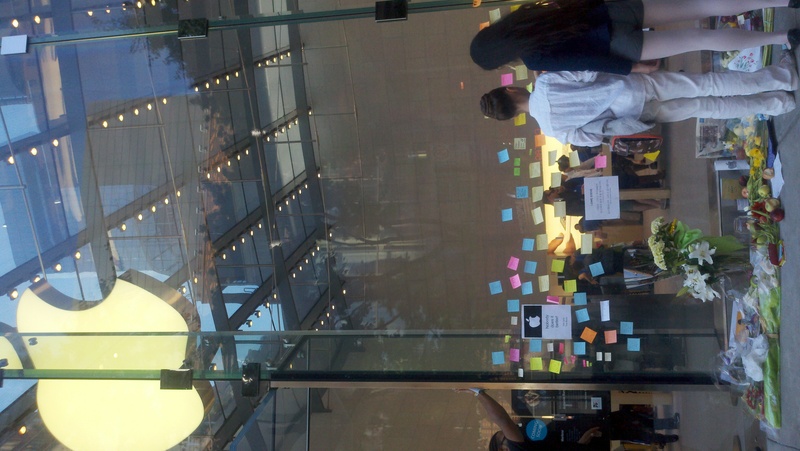 I took this photo outside an Apple store yesterday with my droid. I don’t have an I-anything, no intention of changing that status any time soon. But Steve Jobs was adopted, so I listened with particular interest to his story. His commencement speech at Stanford is iconic and to hear him spoken about, he was relentless, passionate, driven, and a tad bit of a control freak. For me, as a fellow adoptee, I have grown accustomed to having quite an intimate relationship with control and keeping tight reign on it. I find it amusing to hear his story through the adoption lens. I think it’s interesting how people interpret and read stories. One of my List buddies sent out an article – steve-jobs-was-an-arab-american – Jobs’ birthfather. My friend was intrigued by the long standing relationship between the birth siblings and the purposeful estrangement of birthson and birthfather. For some reason, I get that. My heart misses my brother with a yearning, something I can’t say about my Umma. What I got out of the article was how interesting that the son did not stray much from his father. DNA is so very powerful. Jobs’ birthfather was no ordinary man, neither was Jobs. Both men were “out of the box” thinkers. I get the world is sad to see such genius die, but it feels more personal. I am sad to lose another member of our small community. ← Is Korea getting weary of us?